Williams Jerseys is home to Carl and Kevin Williams, third and fourth generation dairy farmers from Morgan County, Ohio. This father-son duo work together to care for their 50 Jersey cows, 25 beef cows and 500 acres of pasture and cropland. Carl: Farming with my family makes everything more rewarding. Since we’re a smaller farm, we rely solely on each other to get everything done. Kevin has been farming with me since he was old enough to walk, and my wife Marlene manages the financials. It’s nice that we have the same interests, the same goals and know we can rely on each other. The farm has also been a great place to raise my family, and to see Kevin raise his family. Do you think cows would rather be in the barn or out on pasture all day? Kevin: The cows that are outside want to be inside, and the cows that are inside want to be outside. We take a lot into consideration when deciding when to let the cows out on pasture, like is there is enough good grass out there, is the weather too hot or too cold, and so forth. They like being outside when the weather is nice and there’s fresh grass to eat, but they also like to be in the climate-controlled barn where there are fans to keep them cool, the flies don’t bother them and they have unlimited access to fresh feed and water. Keeping them happy and comfortable is our number one priority. When the cows are in the barns, how do you keep them comfortable? 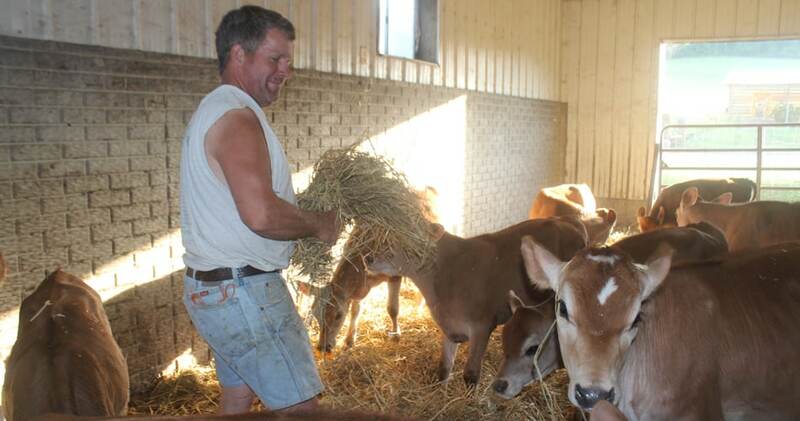 Kevin: In our barn, each cow has their own individual stall lined with a soft rubber mattress for them to lay on, and they are all designed specifically for Jerseys. Every morning we clean out the barn and bed the cows with fresh straw so they’re always clean and comfortable. In the summer time we turn the fans on to keep them cool, and in the winter we can close up the barn to keep them warm. We also keep some of the heifers inside in large pens, and those are bedded with fresh straw once a week, usually on the weekends when my daughters come home to help.